Helloo to everyone from Nashville. It’s been a while since I’ve written a blog, so I thought it’d be a good week to write one. I’ve had a really great past couple of weeks! I’ve been on the first leg of a radio promo tour, and it’s been great visiting all the different radio stations and getting to perform again! I started in Greenville, South Carolina for B93.7’s Zoo-A-Palooza to help raise money for the local Greenville Zoo there. I then went to Louisville, Kentucky where I got to do a show for WDJX with other performers like We The Kings, Hot Chelle Rae, Iyaz, and Kris Allen as the host. It was really fun hanging with everyone there. We then made stops at 106.3 in Lexington, Q102 in Cincinnati, WNCI in Columbus, and Q102 in Philly. It’s fun getting to go to all of the different radio stations! We also went to PRO FM in Rhode Island, which is always great going over to see them! 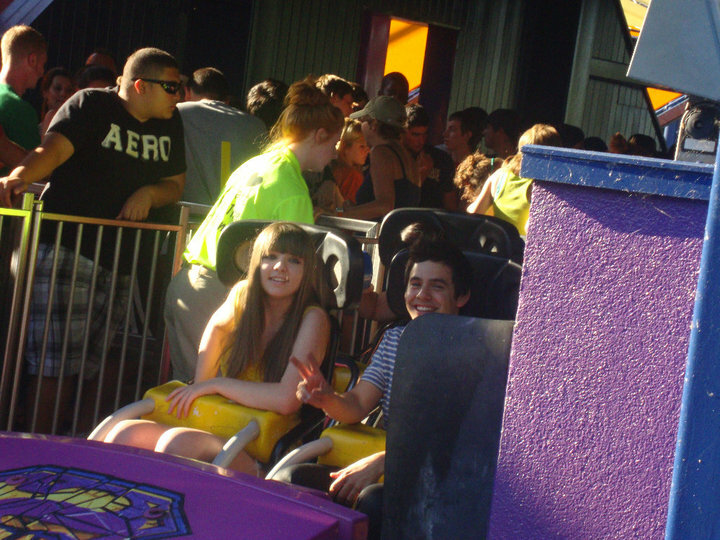 After that we went to Sixflags New England for a show with KC 101 where Auburn, Boys Like Girls, Flo Rida, and Bruno Mars performed at too. I must admit that I’m a pretty big fan of Bruno Mars’s stuff. He has an awesome voice. I’m sure you guys know his new song Just the Way You Are, but if you haven’t then you should really check it out. 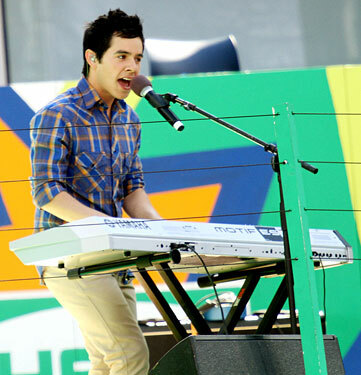 After all the radio promo, it was time to go to New York for Arthur Ashe Kids’ Day where Shontelle, Allstar Weekend, Demi Lovato, and Jonas Brothers also performed. It was really fun. It was cool meeting Allstar Weekend and hanging with them, and then seeing Shontelle and Demi again. I didn’t really get to say much to the Jonas Brothers, but I did catch a bit of their soundcheck. It was cool getting to sing “Something ‘Bout Love” for the first time live.. period.. lol, then also first time live on TV both acoustically on Good Day NY and then with the energy of the band on AAKD. Hope you guys have been enjoying the performances! It’s also been fun getting to introduce another new song from the album called “Elevator” that I first sang in Greenville. It’s one of my favorite songs on the album and I feel is a good representation of what else you’ll be getting from the album :). More of the David vibe haha. So… we’ve been getting things wrapped up with the album The Other Side of Down!! It’s been pretty crazy trying to get everything finalized but we’re pretty much finished and have done all we can under the amount of time that there was to work with haha. I’m really excited! We’re a little over a month away from it coming out October 5th, and I’m already starting to feel the anxious and the jitters. I really hope all the work this last year pays off though for all of you! Anyway I am going to end for today, and talk to you guys later! This song has really been growing on me lately for some reason. Ella is incredible. It seems to me that, if we are to believe hearsay – that Jive sees David as a “long term investment” and that this latest promo shows their support of his music career (despite the long, slow climb out of obscurity for a single like “Something ‘Bout Love”) – then we need to keep the faith. I think it was the fan roller coaster story, in which David’s label set up a fan moment on a Six Flags roller coaster ride, that made me rethink the label strategy. What if these little moments – the fan package deal for the Arch Angels, the Tosh comedy episode, the various radio station visits and fan meet-and-greet moments, the “family” event performances at amusement parks and the like – are part of that “long term” deal? What if the goal is not to sell a chart-burning single but to simply sell David to a core fan community that will grow up with him? What if Jive has no intention of turning David into Bieber – which they could have before Bieber became Bieber – because they do intend to launch David when he’s more mature? What if these are the “growing pains” of maturing his fanbase until he’s of a certain age when he can sing the songs he’s supposed to sing? What if they are quietly catering to his “teen pop star” image so he can subtly grow out of it? As a result, there’s no real push for his pop music to chart if only to avoid trumpeting this public image, which will be really hard to escape when David is, say, 25. If David is in it for the “long haul,” is this all part of a bigger plan? I guess I’m trying to connect these interesting appearances to the lack of SBL radio play (while “Crush” is still getting more radio play of late). Is this the “long-term investment” game plan? I heard it today while waiting on line in the bank, and while I was overseas, I heard it while eating in a restaurant. 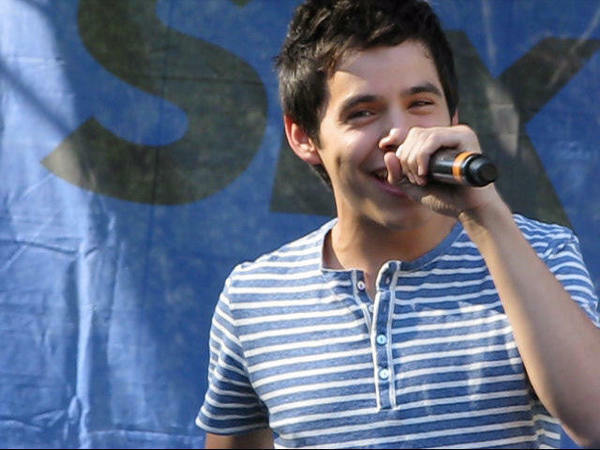 Is David destined to be a “one-hit wonder,” or will SBL eventually find life on the radio? If we are to believe David is a “long-term investment” at Jive, they must have big plans for him. But what does it mean, really, that what I do hear of David on the radio is his debut single and not any new material? I mean, it does give me chills, still, when I hear “Crush” out there on the airwave. It certainly seems that his label is making sure we still hear the Voice. But why an old hit song and not a new one? Is SBL really a bit of a struggle? Perhaps it doesn’t have the magic “Crush” has? (And yes, I am one of those who believes SBL is not on par with “Crush”). Does it mean anything substantial that, when I listen for David on the radio, it’s “Crush” I hear and not “Something ‘Bout Love”?